The southern approach to Death Valley National Park from I-15 is via Route 127, north from Baker to Shoshone, California (56 miles). A mile or so past the Shoshone ranger station, turn east on California Route 178. 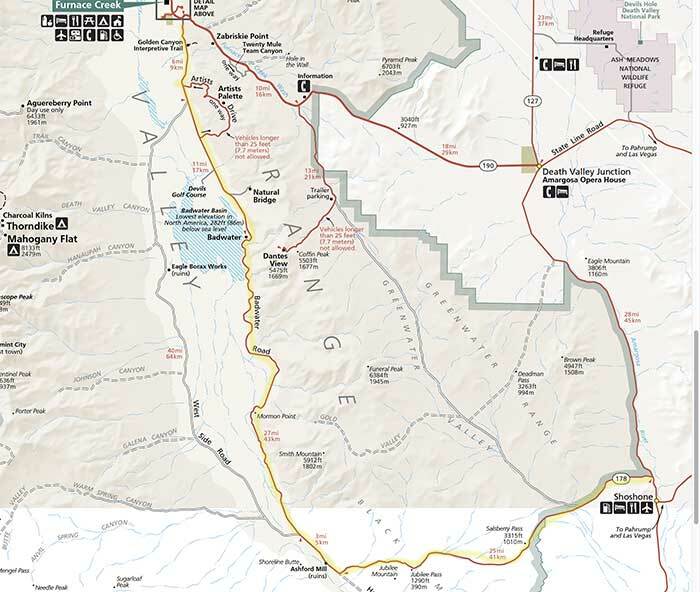 Between here and the Visitor Center 69 miles away, this route crosses Salsberry (3315 feet) and Jubilee (1290 feet) passes, then descending, turns north and runs the length of the Death Valley trough. Along the way there are numerous points of interest. The first is Ashford Mill ruins, built in 1915 to process gold ore from a nearby mine in the Black Mountains. It was abandoned before profits were realized, and only the thick foundation and a tailing (mining refuse) pile remain. From here the road runs below sea level skirting the edge of the Death Valley salt pan, coming closer to it than any other paved road. 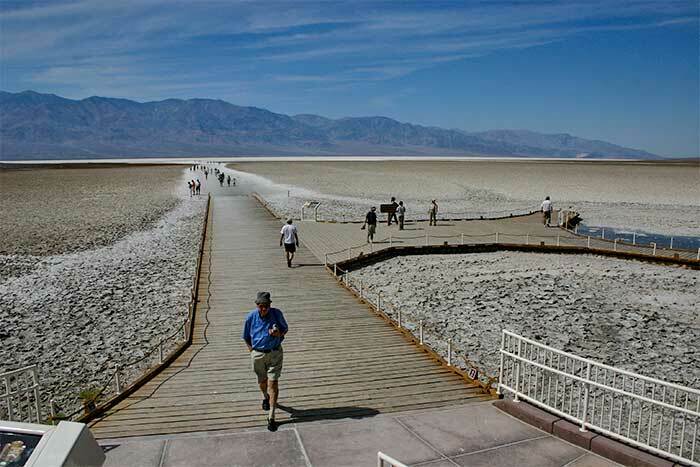 In fact, at Badwater, 30 miles north, the highway, dips as low as 280 feet below sea level, the lowest point in Death Valley accessible by car. Here, there is a permanent spring-fed pool saturated with chloride, sodium and sulfate where, surprisingly, a softwater, soft-bodied snail shares the habitat with beetles and soldier fly larvae. During the peak of summer, this can be the hottest spot in the world, with temperatures exceeding 120 degrees F.
A short distance further, on the west side of the highway, a dirt spur road leads to the Devil's Golf Course. 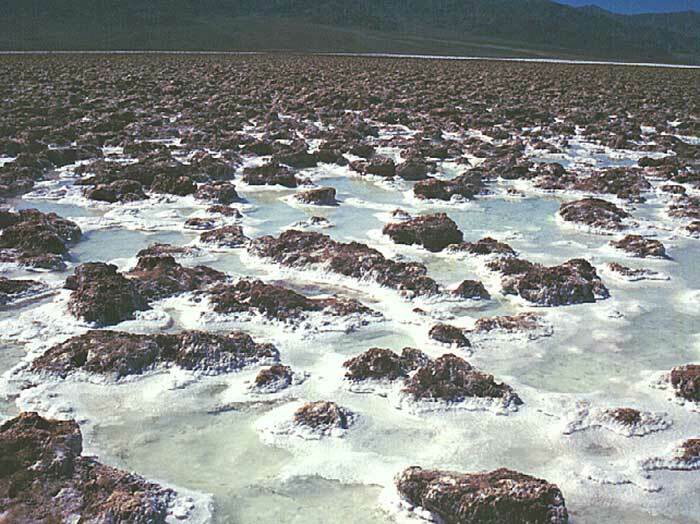 Here, salt pools are surrounded by the salt pan whose surface is covered with unique jagged rock salt spikes, formed by the extreme evaporation in the valley. Another 5 miles on the east side of Badwater Road, Artist Drive makes a loop through a canyon of oxidized sedimentary layers, deposited from an ancient lake bed. 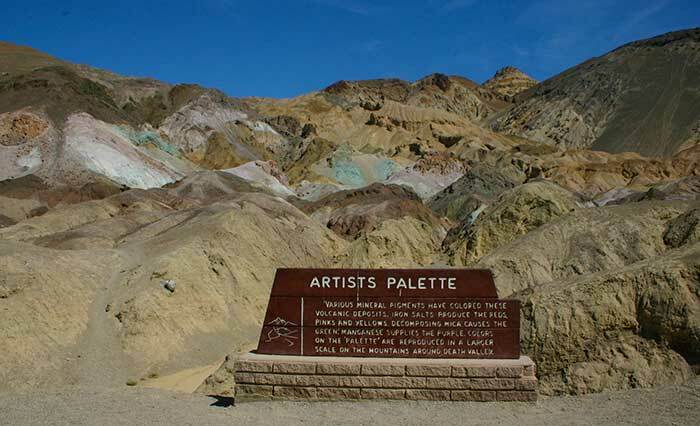 Artist Palette, about halfway along the loop, is the most colorful portion. A little further north, the Golden Canyon Interpretive Trail leads east to the scenic areas of Red Cathedral, a large natural amphitheater, and Manly Beacon, a clay pinnacle named for a pioneer hero. The Visitor Center is only another 5 miles north of here. 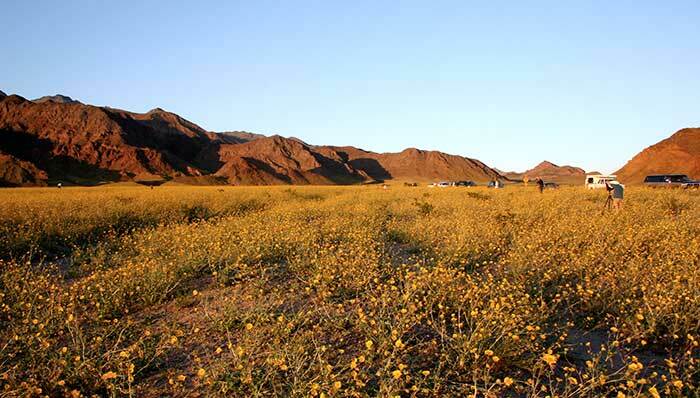 Get our Death Valley information package.